Aston Martin DBS Superleggera. A mighty V12GT with supercar speed. The best resolved of the new-era Aston Martins so far. Huge performance with long distance comfort, wrapped up in a body with real presence. Aston Martin’s avalanche of new models continues, a happy corollary if nothing else of using an adaptable platform architecture. 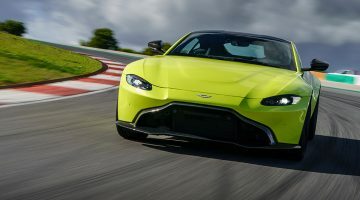 We’ve had the DB11s, with 12- and then eight-cylinder engines, and an open Volante variant, and more recently the new Vantage, which, while showing plenty of promise, has yet to realise its full potential in our view. Now there’s this particularly angry looking coupe, the DBS. 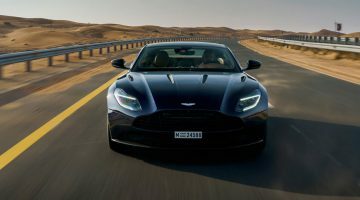 Think of it as a DB11 V12 that’s had a professional makeover and spent a lot of time at the gym; a big, continent-crossing coupe with the performance of a genuine supercar. Once, an evolution such as the DBS Superleggera (over the standard DB11 V12 – these days in AMR form only, remember) would have necessitated the expense and hassle of probably increasing displacement, perhaps combined with new camshafts, valve gear, induction systems and so on. Thanks to the modern era of the turbocharged engine, just a simple remap of the ecu is all that’s now required to hoick the familiar – and these days ‘downsized’ – 5.2-litre V12 up to DBS specification. But what a spec it is: a faintly absurd 715bhp, and with 663lb ft of torque, too. One change that was deemed necessary was a stronger gearbox to cope with such outputs, hence the adoption of a beefier eight-speed torque converter from ZF. The DBS posts some very impressive numbers for a big front-engined coupe. It takes just 3.4sec to get from 0 to 62mph, while a clearer illustration of its potency can be gained from the 0 to 100mph time of just 6.4sec. Flat out the DBS can hit 211mph, so be in no doubt, it’s a seriously fast car. If there’s not much new to talk about with the engine, then there’s plenty of noteworthy news elsewhere. The ‘Superleggera’ name is a nod to the construction techniques used by coachbuilders Touring in the 1950s and ’60s with cars such as the Aston Martin DB5. The modern link here is that the DBS uses carbonfibre panels over its aluminium structure, which the company says contributes to a 72kg weight saving over a standard DB11 V12. Nevertheless, it’s unwise to interpret the ‘superlight’ name in a literal sense: quoted as ‘from’ 1693kg ‘dry’, the DBS is far from a light car. Those expensive carbon panels are formed into an undeniably aggressive shape, but one that also manipulates the air to create 180kg of downforce at the car’s top speed, thanks to a fixed rear wing, working rear diffuser and careful airflow management along the car’s flanks. Under the skin, the chassis sits 5mm lower than a DB11, with the Skyhook adaptive damping re-tuned to suit the DBS’ more sporting role, and with new suspension geometry and bushing characteristics. In terms of overall setup, it sits somewhere between the overtly sporting Vantage and the standard DB series cars. The new ’box runs a shorter final drive ratio over the DB11 to prioritise acceleration, and there’s a mechanical limited slip differential with torque vectoring to help deploy the torque on offer. Braking is via massive 410mm/360mm (front/rear) carbon ceramic discs with six- and four-pot calipers respectively, while 21-inch rims are shod with 265/35 and 305/30 Pirelli P Zero tyres of bespoke construction. There’s a temptation to take one look at the Aston Martin DBS Superleggera and compare it with that other gargantuan front-engined supercar, the Ferrari 812 Superfast. Happily for Aston Martin, the DBS is something quite different: for all its wildly slashed bodywork, gaping air intakes and dramatic proportions, this is very much a GT car – one that majors on readily accessible and almost endless reserves of performance, yet still combines them with comfort. It’s a big car, and always feels it from the low-slung driving position, with the extremities mainly hidden from view: placing it on narrow UK roads won’t always be a comfortable experience. That V12 has a significant presence, whether on start up or pulling hard through the mid range, and only at higher rpms does it lack the quality of tone possessed by its naturally aspirated older relations. In fact, the first impression of driving the DBS Superleggera is how easy it all is, from the surprisingly supple ride – only occasionally do the low profile tyres protest over a bad surface – to the seamless shifts of the auto ’box and the light and very quick steering. But the potency of the V12 is readily apparent, because even a small application of throttle is enough to surge past slower moving traffic; the DBS is a hilariously effortless overtaker. There are the now three familiar modes for the engine and ’box, and also a further three for the ‘Skyhook’ adaptive suspension. Switching out of ‘GT’ into ‘Sport’ provides a keener throttle response, and a lot more noise from the exhaust, and while the car’s soft-ish ride is a positive in normal driving, you’ll soon crave greater body control when the pace is upped. Like all the modern-era Astons, the DBS features a fast steering rack that does take a little getting used to, but its accuracy and natural weighting are both plus points, and the DBS certainly shrugs off its mass well. When pressing on, the rear of the car feels notably soft, presumably to aide traction, but the result is that over a bumpy road in particular, the rear axle does feel like it gets a proper work out. There’s a definite sense of the car’s rear pitching up and down, and also of random movement from side-to-side as the suspension tries to cope with all that torque being deployed. It does feel better resolved than the Vantages we’ve driven to date, but the family characteristics are certainly there: the only pragmatic option is to accept that this is the way the DBS goes about its business, and that it doesn’t necessarily mean there’s a major loss of grip on the way. Of course, with the stability system off, the DBS will easily lose traction at the rear, although the diff isn’t always that predictable in whether it will allow a single wheel to spin, or the tail to flick sideways suddenly. It’s at that point that the DBS can suddenly feel like a very large car indeed. Meanwhile, the gearbox is like most torque converters in high power applications: fantastic in day-to-day driving, but slightly less convincing at high-rev upshifts and sudden and continuous shifting of cogs. On the plus side, there’s absolutely nothing wrong with the brakes whatsoever, the DBS pulling up very convincingly even from very high speed. Overall, once you’ve sussed the car’s limitations it’s possible to cover ground at a very rapid rate, revelling in the enormous thrust of the V12, leaning on the ample reserves of grip and enjoying hustling this big coupe on all types of road. Factor in the DBS’ relative practicality and the car’s personality really starts to make sense. Yes, it’s thirsty for super unleaded, but you’ll easily fit younger family members in the two rear seats and the boot is fairly generous too (even if your luggage will get very, very warm back there). The interior features soft, expensive-feeling leather and the Mercedes-derived infotainment system is leagues ahead of Aston’s previous efforts, but some of the switchgear feels out of place in a car wearing this price tag and overall it lacks the wow factor inside of the Bez-era Astons. The beauty of the DBS is that it has no real rivals. The aforementioned 812 Superfast is a much more aggressive, focused sporting machine; a new Bentley Continental GT meanwhile can’t live with the Aston’s performance, or match its dramatic styling. Yes, a Mercedes-AMG S63 Coupe is immensely capable, but it’ll never draw a crowd in the street like the DBS Superleggera will. Whichever way you look at it, the DBS sits in its own niche. At $295,000 it feels expensive for what it is, but nevertheless, there’s much to celebrate here.